April Kennedy...My Life + My Style: AAHHHHHH. Imagine my sweet surprise walking into the grocery store yesterday and finding two of my most favorite things. 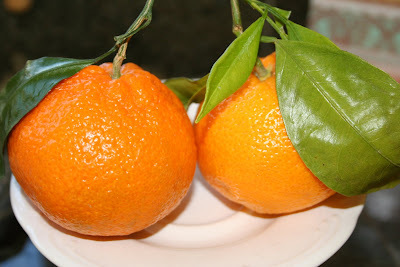 these are so much better than the "cuties" mandarins. I bought five stems of the peonies and paired them with pretty white tulips and I bought 16 of the satsuma oranges and they will probably be gone by tomorrow. I walked out of the grocery store, sighed, and thought "if these were my only two Christmas presents, I would feel completely satisfied." Oh and remember that sweet little plate that Hubs picked up for me at an antique store while in Petaluma working one day. I made it into a little cupcake plate and just love it. I'm not sure I can sell it now. It has such a sweet story attached to it. Isn't it darling. So much cuter even in person. Sometimes pictures don't do them justice. I have almost completed my Christmas shopping, I was hoping to be done by now....but I'm still looking for the perfect gifts for a couple of people. And, Dave and I while sitting on the couch last night, vowed to have all the wrapping done before Christmas eve so we can enjoy the evening together after the kids go to sleep. We will see how we do the next few days! Happy wrapping!!! I haven't even begun to tackle the list of people I have to buy for! Oh I'm a glutton for punishment! Oh and yes, we will be finding out what little marshmallow is!! There is no way I can not know. The suspense is already killing me at 12 weeks!!! That cupcake plate is really cute. 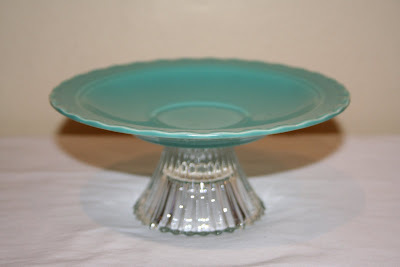 Your right the pictures don't do your cake plates justice. They were so cute at Lyn's house. 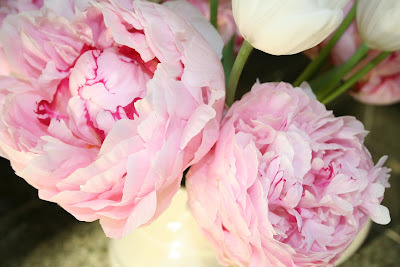 I love peonies too! Those look so Springy. You have got to love living in CA. I like the cuties because they are so easy to peel but yours are definitely sweeter and yummier! Enjoy!! Your plate is indeed adorable and you should definitely keep it. I love your cupcake plate. Very nice! I also liked the christmas toile plate stand that you already sold! I think that plate is really cute...and that's something big. I'm not a girly girl, I don't get too excited about flowers or dishes or whatnot. Registering for my wedding was tedious, NOT fun. LOL I didn't really care and just went for practical things. How boring am I? LOL SO, when I say I like that plate...I really like it. Keep it. i'm wrapping all day long today! and mmmm those flowers are soo pretty!